Welcome to our home, Life's Good. Our 1812 square foot luxury villa includes 3 bedrooms, 3.5 bathrooms and has a maximum occupancy of 10 people. Sit out on the front balcony with a view of the swimming pool. 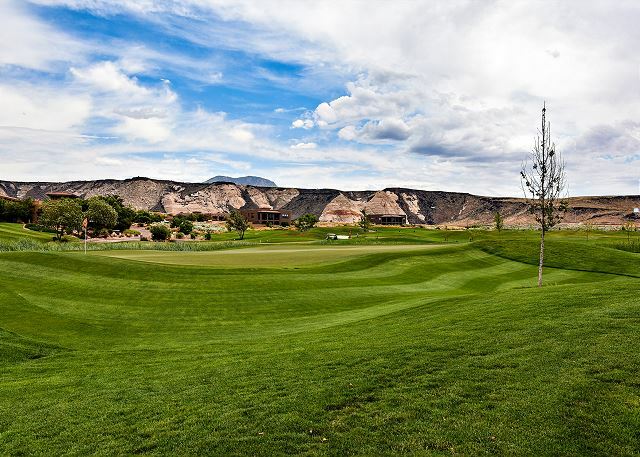 Relax while enjoying the view of the 18th hole on The Ledges Golf Course. The living room is designed as an open floor-plan and is a great gathering place for meals, games, or watching TV during your stay. The master bathroom that is adjacent to the master bedroom is large and luxurious. With his and her sinks, toilet, vanity, walk-in shower and a large walk-in closet. Bedroom 2 is a large bedroom which includes one queen beds and one full bed, walk-in closet and private satellite TV. Life's Good with this beautiful and inviting entry way! Downstairs Half Bathroom includes toilet, sink and vanity. Life's Good is a beautiful 1,812 sq foot home with 3 bedrooms and 3.5 bathrooms. This luxury villa is furnished with all the upgrades you could ask for, including flat-screen HDTV's, granite counter-tops, as well as stainless steel appliances. The floor-plan is spacious with bedrooms that are quiet and private. Whether you're looking to relax or spend your day enjoying the surrounding landscapes, you can rest comfortably in the contemporary style bedrooms, partially covered outdoor patio, or spend time with family and friends in one of the two family rooms. Kathy, Thank you for choosing to stay with us at The Ledges. We appreciate you taking the time to give us such a great review and are happy to hear that you loved the home. We look forward to helping you again in the future. Thank you, from all of us at The Ledges. This was a golfing and National Parks getaway. The Ledges offered the perfect spot to return to after a busy day. The condo was spacious and clean with a nice view of the 18th green. While we enjoyed the patio, the grill was dirty and unusable. The A/C upstairs could not be controlled and guests had to turn on the heat to be comfortable. The water temperature was not hot until a maintenance person discovered that the water heater was set on low. We received great service from the staff at the Ledges. My suggestion would be that they need to check out the condo more carefully before guests arrive. Jane, Thank you for choosing to stay with us at The Ledges. We appreciate you taking the time to review us. I am sorry to hear that you experienced difficulties during your stay. I have let management know of your suggestion so that we can prevent this from happening to another guest. We look forward to helping you again in the future. Thank you, from all of us at The Ledges. Every year we three couples get together from Arizona, Utah and Colorado, and we have always used HomeAway to make our lodging arrangements. This year, once we decided on St. George as our destination, it was difficult to make a choice as to our lodging because there were several places from which to choose. We were all delighted that we chose the Ledges. The three bedroom, 3.5 bath condo was just perfect for our needs. The common areas were more than large enough for our the card and board games that we enjoy playing together, and the kitchen allowed each of us to prepare our own meals as we saw fit. We will be back in the near future. Gerald, Thank you for choosing to stay with us at The Ledges. We appreciate you taking the time to review us and are happy to hear that you were able to enjoy your stay. Thank You and we look forward to helping you again in the future. Thank you, from all of us at The Ledges. We had a great experience the location was great and the condo was perfect. Very clean, very nice furnishings, very comfortable beds. We will definitely be staying here again. Shari, Thank you for choosing to stay with us at The Ledges. We appreciate you taking the time to review us and are happy to hear that you were able to enjoy your stay. Thank You and we look forward to helping you again in the future. Thank you, from all of us at The Ledges. Jerry, we appreciate your kind response in regards to your stay with us at the Ledges. 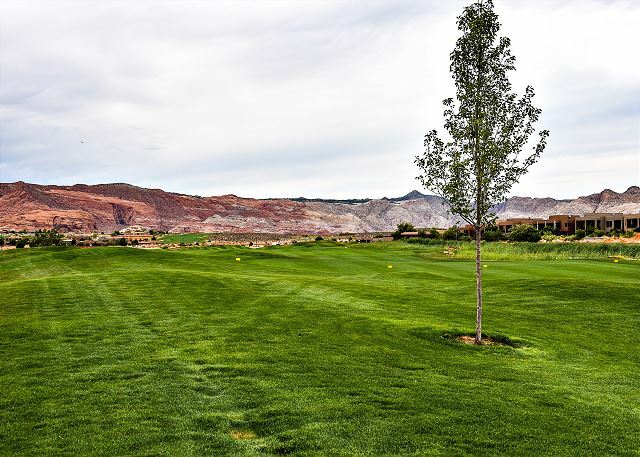 We are happy to hear that you enjoyed the property as well as the amenities it has to offer (golf course, pool, pickelball courts). We hope to see you again in the future! Thanks again, from all of us at The Ledges. Excellent. Property was as advertised. Excellent location on the Ledges golf course, near 18th green and practice area. Bookings at other courses were handled by management. Even the weather was perfect. Steve, we are happy to hear that you enjoyed your stay with us here at The Ledges. Thank you for your kind response in regards to the property and management team. We hope that you will come see us again soon! Thank you again, from all of us here at The Ledges. We usually stay in a hotel on our yearly golf trip, so this was a new experience. It was SO much better, and will be the only place we stay from now on. Thank you for your kind words. We are happy to hear that you enjoyed your stay here at The Ledges. We hope to see you again in the future! Again, thank you from all of us here at The Ledges. Such a fun place to stay. So many great amenities and the home was clean and happy!! Noelle, thank you so much for coming to stay with us here at The Ledges. We truly appreciate you and thanks for your honest review of this home. We pride ourselves on customer service and having a nice clean home for our guests. Please now you are welcome back here anytime! Thank you again from all of us here at The Ledges. Golf, biking and hiking heaven. Everything was perfect. We loved our stay. Will be coming back again. Thank you so much for coming to stay with us here at The Ledges. We appreciate the opportunity of having you. It so nice to hear that you enjoyed the great hiking & biking close by. Please know you are welcome back here anytime! Thank you again from all of us here at The Ledges. Very clean & comfortable townhouse, we enjoyed our stay, had everything we needed... beautiful scenery and close to restaurants and all parks. Shari, thank you so much for coming to stay with us here at The Ledges. We appreciate your honest feedback of this beautiful vacation villa & the surrounding area. You all have been such a pleasure to work with and we hope you will come see us again, as you are most welcome back. Thank you again from all of us here at The Ledges. A++ to Dan Dekker for all of his help and his attention to detail. We used this property for our yearly golf trip and everyone enjoyed their stay. Short drive to downtown Saint George. Comparable price to Myrtle Beach, would highly recommend for a vacation destination. Luis, thank you so much for coming to stay with us here at The Ledges. It was an absolute honor having your golf group come and stay & play the area. We appreciate your honest review of this gorgeous vacation rental & will let our property manager Dan, know your thoughts about his service. We look forward to having you all back in 2 years :) Thank you again from all of us here at The Ledges. Gorgeous scenery, great dining, with challenging and fabulous golf course. The front nine was a great warm up for the scenic and fun back nine. We will be back. The accommodations were fantastic with all the comforts of home. We appreciated the DVR so we could record the World Series and watch after dinner at the Rock Fish Grill with beautiful setting and great food. Marjorie, thank you so much for coming to stay with us here at The Ledges. It was an absolute honor having you all stay & play this beautiful course. We appreciate your feedback on Fish Rock Grill along with the luxury vacation villa you stayed in. We hope you made some great memories and want to see you back soon. If you need anything, we are a phone call away. Thank you again from all of us here at The Ledges. We love this house, we have stayed there two times. We will definitely return soon! Thank You for staying with us again! We are so happy to have you and always excited to see your reservation come through. Please come back as we welcome you with open arms. Here's to seeing you in the near future. Thanks again! This was a nice condo, a little out of the way as far as being not in St. George, but quite and fun. The pool is great for kids! They have a nice large spa, a large sun shelf in their pool. It was quite and there is an amazing walking trail near by!! Thank you for staying with us here at The Ledges. It was a pleasure having you and we truly appreciate your feedback. Please keep us in mind for your next visit. We would love to have you stay with us again! Thank You for staying with us here at The Ledges. It was an absolute pleasure having you and we look forward to having you back! This almost brand new condo was the perfect place for a golf weekend. It was immaculate and had everything we needed. We will definitely stay here again. We are glad that you had a an enjoyable golf weekend and look forward to having you stay with us in the future. Thank you for your review!